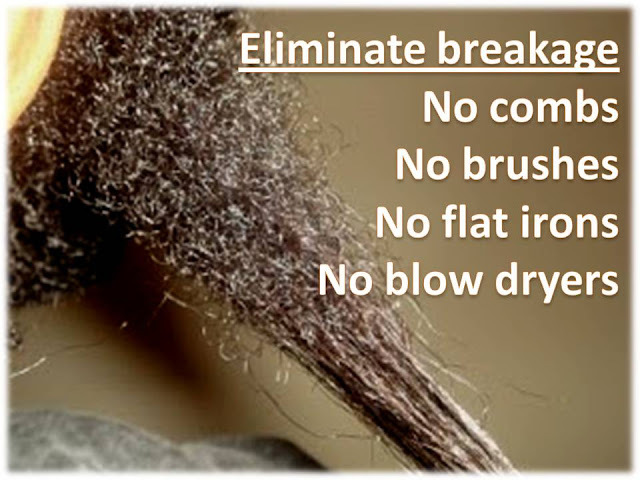 Most hair breakage is caused by the hair tools we use for grooming. Here I offer some healthy alternatives for some very popular hair tools we use as black women. Most women use a comb, to style and remove tangles. If you use combs to groom your hair, stop using them for 30 days. You will notice that you retain a lot more length by using a comb on your tresses. Instead of relying on a comb to remove your tangles, use your fingers. Fingers and thumbs can do an amazing job of removing tangles from any type of Afro curly hair. No curl type is to difficult that it cannot be finger detangled. Do not expect it to work as quickly as using a comb. Untangle to remove knots do not expect your Afro hair to be totally free of tangles. Untangle hair with your fingers. Use your fingers to create your first part. Go back and clean your part up using a knitting needle or the pointy part of a good quality rattail comb. Avoid those cheap rattail combs which are rough, those will break your hair worst than a comb. You want a good quality rattail comb that is smooth. I am sure you have watched dozens of youtube videos of women raking brushes or tangle teasers through their coily hair. And it looks so good. However using a brush on your coils is so unnecessary and unhealthy. The brush rakes across your hair cuticle and roughs it up. Each time you rake the brush through your hair you are weakening your hair cuticle little by little. The damage is slow which is why most do not notice or relate the damage to the brush. 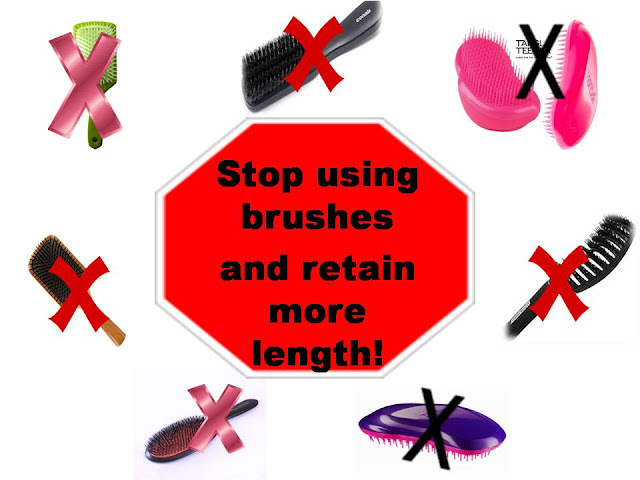 If you are not reaching your hair length goals eliminate hair brushes completely from your hair regimen. Your hair will be healthier for it. Change your mindset about your coily hair. When you do a bun do not think your hair has to look sleek like Caucasian hair in order for it to look polished. Accept your hair however it lays, as long as it is neat. Hair has been smoothed back by using a little gel and my palms. Once in place hair is tied down with a scarf for 30 minutes or overnight. Afro hair will dry into any shape you mold it into. No brush needed. Neat does not mean sleek. Apply your product on wet hair. Spend time using your palms and product to smooth the hair back. Tie hair down immediately using a satin scarf. Your hair will dry neat and flat. If you must, you can use a toothbrush on your edges. A blow dryer is one of the worst types of heat you can use on any type of hair. No matter the curl type. Blow drying leaves the hair hard because all moisture is removed. Blow drying is not conducive to Afro coily hair. Never blow dry your hair if you want to retain length and hydration. 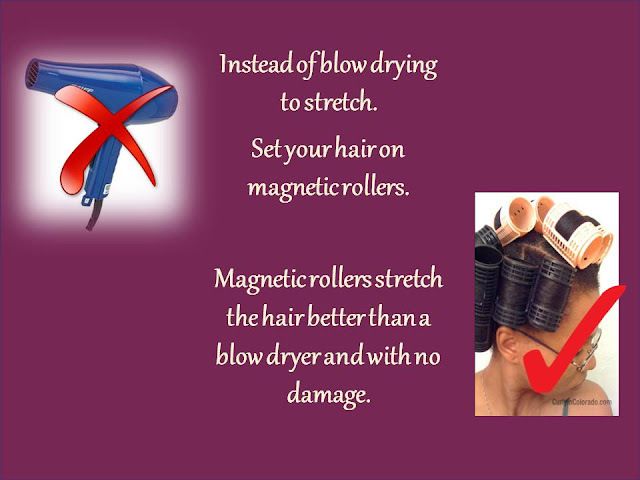 Set your hair using magnetic rollers on very wet hair. Allow hair to air dry, the next day your hair will be stretched but moisturized and soft. Allow hair to air dry by 70%, then create your two strand twists. You will have more stretch to your twist out, setting it this way. Each time you flat iron the hair you stand a big chance of receiving heat damage. Any type of heat straightening changes the hair structure slightly. Even if your hair reverts. Your hair is still not the same. There is no good substitute for flat ironing the hair. Nothing healthy will give you the look of flat ironed hair. When you get ready to flat iron, do not also blow dry the hair. Let your hair air dry, so you have less damage. You can also stretch your hair by doing a roller set before you flat iron. Always deep condition your hair well before you flat iron. If you are having dry hair issues never heat straighten your hair. You will damage it. Applying these tips to your hair care regimen will enable you to retain a lot more length. You will also have healthier hydrated hair.